- This service does not support IMEIs from MetroPCS USA. If you submit a MetroPCS USA IMEI, the order will be replied unlocked and refunds will not be available. - Refunds only available for this error message: "NOT ELIGIBLE FOR UNLOCK"
- We do not refund for "Server not responding. Please try again later." or any other message. If your device shows one of these messages, try upgrading the firmware or performing a hard reset. 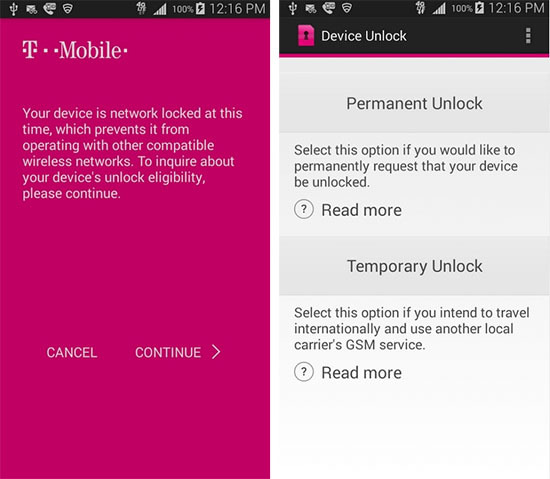 Con este servicio podrás desbloquear todos los Teléfonos de T-Mobile con nueva seguridad Android Device Unlock App.